We've kept it under wraps until today's official online release but back in July we shot a music promo for a remarkable band called Brutus for their track 'Horde II'. The Belgian trio, led by multi-talented vocalist and drummer Stefanie Mannaerts, are an incredible live band and so their management, Hassle Records, wanted a high intensity, performance led video to show new listeners what they're all about. 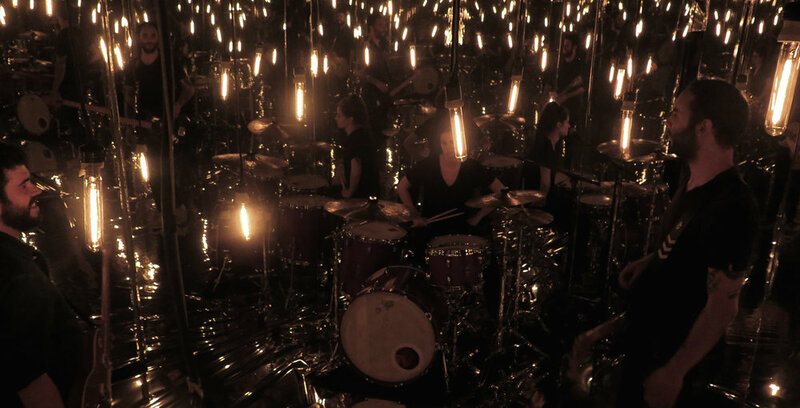 The concept selected by Hassle, created by Capture's Lee Holmes, was to create a completely mirrored environment in which the band would play, with the band enclosed by the set the restricted space was juxtaposed by the infinite reflections the mirrors created. The band's energy literally bounced off the walls and we were able to encapsulate the brilliant intensity of a live Brutus performance. As you can imagine creating a fully mirrored space, large enough for the band and at the same time ensuring no camera's were ever in shot came with it's challenges! But we were able to shoot some great footage of Brutus, masterfully edited by Lee Holmes and graded in the brilliant grading facility Studio RM by Jamie Noble to give the promo a really high quality finish. Director Lee Holmes looking into our mirrored box. The set ready for our band - notice our blankets to protect the mirrored floor! The band set up and ready to go.